Pure Usenet - Review And Speed Test - A Good Choice? Pure Usenet is a provider for everyone on a budget who still wants to enjoy quality Usenet. Especially if you have a slow Internet connection, this service is worth a shot. On first look, it doesn’t seem to be quite up to recent standards: Retention is lower than usual, at about 1100 days. Certainly this is still a lot of time, but most premium providers have over 2400 days retention, so Pure Usenet falls a bit short here. All plans have unlimited volume, some have speed limitations. However, prices start at only €1,83 per month for 4 Mbps (“Pure Usenet XS”), and €3,43 per month for 20 Mbps (“Pure Usenet M”). These prices are the absolute bottom of what you pay for quality Usenet access, and especially the “M”-plan is really interesting for a lot of users. Also, they allow account-sharing, so you can even share the account with friends and family, and split the costs. Another provider from the Highwinds Group joins our website: Pure Usenet, which is particularly made for anyone on a tight budget, offers relatively high quality for a very reasonable price, although we would have liked more retention time for files. Thanks to the good people of Usenetjunction who provided us with a free test account, we are pleased to offer you a complete review of this service. Sure enough, the website looks nice and tidy, with all relevant information right on the front page. This no-nonsense approach is appealing and refreshing, but we also have to notice how some parts of the website have not been properly translated into English, as you can see in the picture below. Also, some pages have not been updated recently, and still show 900 days retention instead of over 1100. Also, provider XLNed is mentioned somewhere… we can only guess both services use the same servers. Please take care of your website, guys! You should definitely update that. Other than that, things are straightforward. You head over to the sign up form, enter your information and plan, along with your desired payment method, and hit “Order now”. Alternatively, you can choose to get a 7 day free trial, without having to enter any payment information, something most other providers don’t do; definitely a big plus. Afterwards, you get your login information and all data you have to enter into your newsreader to start downloading. As we mentioned above, Pure Usenet has a lot of plans with speed limits, which are very cheap on the lower end of the spectrum. Five different packages with speeds from 4 to unlimited Mbps can currently be ordered, and prices start at only €1.83 per month for a 12 month payment period. Everyone who has a slow Internet connection might get a very good deal here, and even the monthly contracts are very unexpensive, only about 25% more expensive than the yearly plans. For example, the “XS”-plan, which comes with 4 Mbps maximum speed, costs €2.29 a month when paying for a month, or €1,83 a month on the yearly plan – both are inexpensive. Now, this might seem very slow for a lot of people, but keep in mind not everyone has a big bandwidth. 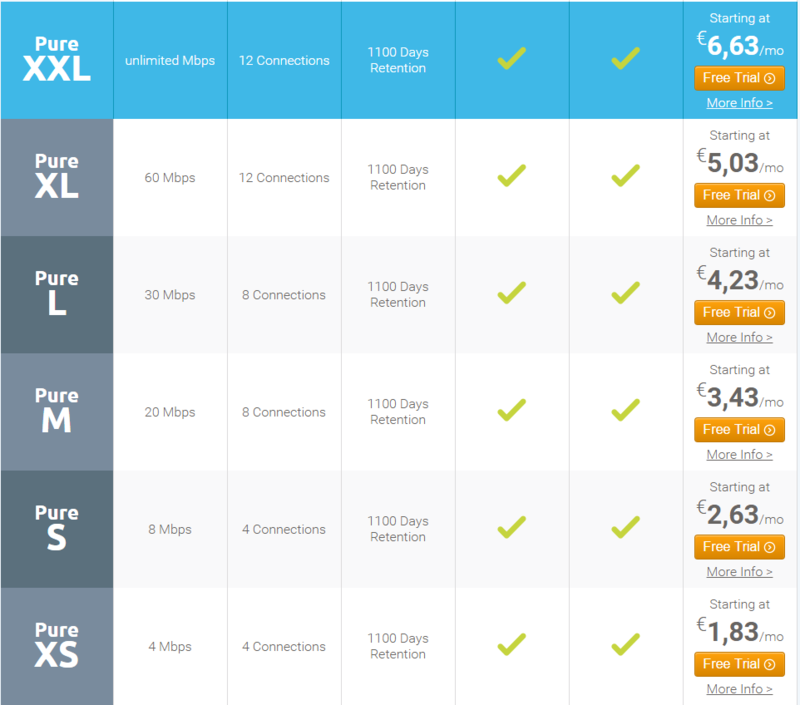 For someone who is fine with a retention of 1100 days, and has only a 20 Mbps connection (standard speed for many regular connections you see ads for on TV), the “Pure M”, starting at only €3,43 a month, is the perfect fit, and there is absolutely no need to pay for more. The available speeds are 4 Mbps (“XS”), 8 Mbps (“S”), 20 Mbps (“M”), 30 Mbps (“L”) and 60 Mbps (“XL”), which starts at €5.03 a month. 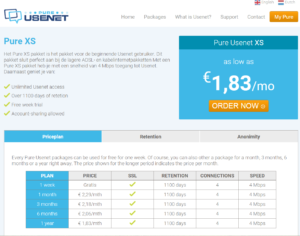 The only plan we’re not so sure about is the “Unlimited” one: €6.63 a month is not very far from the 8 dollars you have to pay for a subscription at Astraweb, which offer more than double the retention of Pure Usenet, and 12 connections are not enough to max out our Internet connection. For anyone on a very fast connection, Pure Usenet might not be the best choice. Anyone else gets a very decent service for a very small price. Definitely a good alternative to the more expensive and large providers. As you can see, we got around 80 Mbps. Not a bad result and certainly enough for most people, but only 53% of what our connection can do. Retention: This number describes how long old files are kept on the Usenet servers of your provider. About 10 years ago, the usual retention time was about 30 or 90 days, so older files were deleted pretty fast. In the last years however, this increased drastically, and Pure Usenet is no exception. Currently, retention is at about 1100 days, or about 3 years. This is ok, but other premium providers offer over 2400 days, which is more than double. For the price however, we consider it to be acceptable, especially if you go mostly for newer stuff. Unlimited accounts at a very cheap price with acceptable retention, for anyone who doesn’t care for high speed or has a slower or more “standard” Usenet connection, Pure Usenet could be a very interesting alternative. With plans starting at under $3 per month, they are surely on the very low end of the price scale for quality Usenet. If this is what you look for, feel free to give them a go. With the 1 week trial, you can test them for yourself. PS: Since, in the past, a user reported that he wasn’t able to find the right website of a service we reviewed, we always include a short, live preview at the bottom of our reviews. We recommend you just click the button on top of this page, and you’ll be redirected straight to the right website. Retention angeblich 1200 Tage aber viele Dateien die schon nach 60 und mehr Tage nicht mehr vollständig ist und auch nicht repariert werden können. While I never tried this usenet, beware that they use fake reviews on their site. I emailed them about it (twice) and never received an email back. Providers with fake reviews usually have very poor service.